What we like about this pillow is that it is not only comfortable but hypoallergenic as well. We don't like that it doesn't have such a good warranty. For a quality sleep it is very important that you don’t own only a very good mattress, but a very good pillow as well. This item definitely plays a very important role when it comes to the comfort of your night’s sleep. It is highly recommended that you go for bamboo fabric instead of cotton, as it is much better from many points of view. One of the best products that you can purchase these days is the bamboo pillow manufactured by Miracle, which is available in the shops today for £69.95 if you opt for the queen size, and for £79.95, if you opt for the king size. For more details about this item, continue to read this review. This pillow is made of shredded memory foam, covered in a high-quality bamboo pillow case. The clean, consistently sourced shredded foam has been controlled for a high performance, and it is a combination of recycled and virgin material. A better rest will definitely be provided by this modern product, which has actually become quite popular these days. The bamboo cover is ultra soft, and it is naturally antimicrobial and hypoallergenic as well. Furthermore, it actually resists dust mites, germs, and odors as well. Thanks to these wonderful features, this pillow will actually make you feel ultra comfortable, especially if you are an allergy sufferer or an asthmatic person. It is made from a breathable fabric, so people with sensitive skin will also highly appreciate this item. It weighs 3.4 pounds and it is 28-inch long and 20-inch wide, if you choose the queen size, and 36-inch long and 20-inch wide if you opt for the king size. The rectangle shape is absolutely great for your comfort and for the design of your bedroom as well. Another excellent thing about this pillow is that it wicks away moisture, while it will actually regulates temperature, so that you can feel extremely comfortable at all times, no matter the season. The memory foam will take the contour of your entire body, in order to perfectly cradle your neck, head, and shoulders as well, for a deep relaxation. Once you are super relaxed, you will also find a lot easier to fall asleep and rest during the night. Therefore, your sleep and the quality of your life will considerably improve. You will become a healthier and a more optimistic person. This model is designed for side, back, and even stomach sleepers, and it has heat dissipating properties that will actually keep it cool all night. This is a huge advantage, especially in the summertime. You will probably be surprised to find out that this wonderful pillow never goes flat, it actually always comes back. You can either use it on the side, for a super soft and fluffy support, you can use it flat in order to cradle your neck and head, or you could use it as a bolster when watching TV or reading. All these three positions are absolutely great and they will provide you the necessary comfort without a doubt. Are you traveling a lot? If so, then the good news is that you can take this pillow with you. It can be rolled tightly for traveling, and then it will quickly fluff back up, so that you can rest very well at night, and wake up without any neck or shoulder pain. Regarding the durability of this product, the manufacturer says that it will last a long period of time, and that it will actually look like new after several months as well. Furthermore, the bamboo cover is machine washable, and it will certainly not be affected absolutely at all. There are plenty of users that are very happy with this item, which they highly recommend it. This item is available on the market today with a 60-Day Money Back Guarantee, less P&H. Therefore, if you are thinking about making a great purchase, then this model is the best option you have. As you can see, this model is one of the best options available on the market when it comes to buying a high-quality bamboo pillow. The shredded memory foam is just what you need to improve the quality of your sleep, while the soft bamboo case will keep you away from any allergies or germs. Furthermore, the pillow is also recommended for those who suffer from asthma and usually struggle with the effects of a poor quality night’s sleep. For increased convenience, the cover of the pillow is machine washable, so you can safely clean it every time necessary. Last but not least, we consider that it is specially made to change the unhealthy sleeping position that usually leads to neck and back pains, by promoting a better rest during the entire night. 1 What density is this pillow? On a scale from one to ten, one being the slightest and ten bing the firmest, this bamboo pillow is somewhere around 8 and 9. It is over filled and very firm. 2What does it say on the label? Is it machine washable? The pillow comes with a removable cover that can be washed. Make sure you do not use fabric softeners. 3What is the difference in size between the king and queen? A few inches in length. I’m a side sleeper, and my wife is a stomach sleeper. 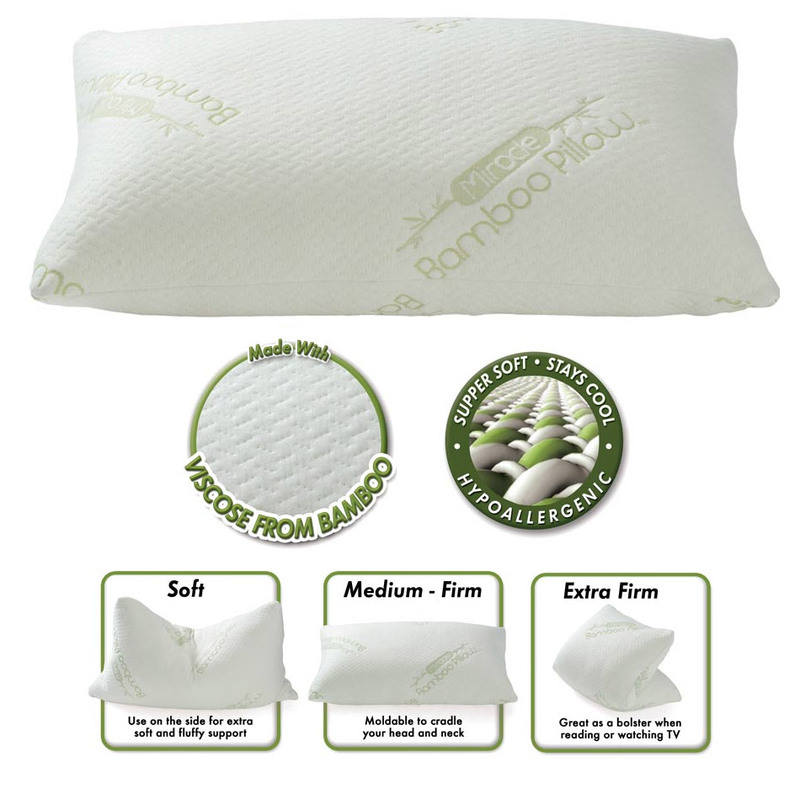 I would like to know if the Miracle bamboo pillow is a good choice to go with for the both of us when it comes to head and neck support. Yes, this model is great for all types of sleepers, including side and stomach sleepers. No matter how you move your body during the night, it will provide the support that you need for the both of you to wake up feeling energized in the morning, without feeling back or neck pain that might ultimately lead to a great discomfort. In the review, you state that this pillow cradles the neck, head, and shoulders. Does this mean that it will create a warm, even hot environment during the sleep? I ask this because I tend to wake up easily when it feels too hot, and I don’t want to buy a pillow on which I won’t sleep comfortably. Hello, Danny! We are glad to inform you that the Miracle Pillow doesn’t create a hot environment to sleep in, despite the fact that it perfectly cradles your neck, head, and shoulders while you sleep. The pillow’s amazing cooling properties are ensured by its heat dissipating properties, the bamboo that goes into its manufacturing providing an amazing breathability. Hi there! I work as a flight attendant, and I am interested in finding out how well this pillow resists if it will be rolled for traveling often. This is the perfect choice to go with if you travel often precisely because it doesn’t lose its fluff and amazing quality. With it, you will sleep like an angel no matter how many timer per week you have to roll it to fit in the travel bag! Hello, everybody! I bought this pillow a few months ago and it still is in the same condition as the day I bought it. It is a great pillow and I strongly recommend it. Hello! I need a pillow to support my back and neck, without being too full. Will this pillow work for me? This is a very firm pillow. It isn’t too hard and conforms to individual sleeping styles. It supports your back and neck well, so you should confidently go for it. This model comes at an attractive price of $33.90. Does this pillow come with a carrying case? Hi, Joanna! It doesn’t come with a carrying case. It may be packed in a cartoon with a handle or in a plastic. Best pillow ever. It is comfortable and provides great neck and head support. Although the manufacturer claims it is machine washable, the warranty documentation doesn’t show this aspect and the instructions are a bit confusing as well. However, it comes with a removable cover that can be washed. I bought this pillow a few days ago and it still has a chemical smell. I didn’t notice the bad smell right away and I don’t know what to do about it. Does it go away? Hi, there! The smell goes away after one week. If it still has the bad smell, try washing the cover and leave the pillow out to the air for a couple of days. Best pillow ever. I like this so much I had to order a second one.